Remember the small yet eye-catchy “Pick 5 differences” column in your Sunday daily every week?! An arduous session of mental exercise used to follow thereafter, to recognize the minute alterations among the two rather similar snapshots. The difficulty level, quite undoubtedly tricky; it is reasonably dicey to distinguish the small differences, and hence, separate the two. Effective energy-economic separation of azeotropes (mixture of two or more physically similar liquids, possessing a constant boiling point and composition throughout a simple distillation process) deals with a very similar challenge, since simple distillation often fails to separate the pair of constituent hydrocarbons from their industrial mixture feedstock. Among the industrial azeotropic mixtures, separation of C­6 hydrocarbon flow-stream to separate pure benzene (Bz; aromatic species), over its aliphatic analogue cyclohexane (Cy) from their binary mixture is a daunting task, due to their related molecular sizes and geometries, extremely close boiling points (Bz, 353.3 K; Cy, 353.9 K), as well as the realistic improbability of using conventional fractional distillation route to separate the duo. Fig. 1. 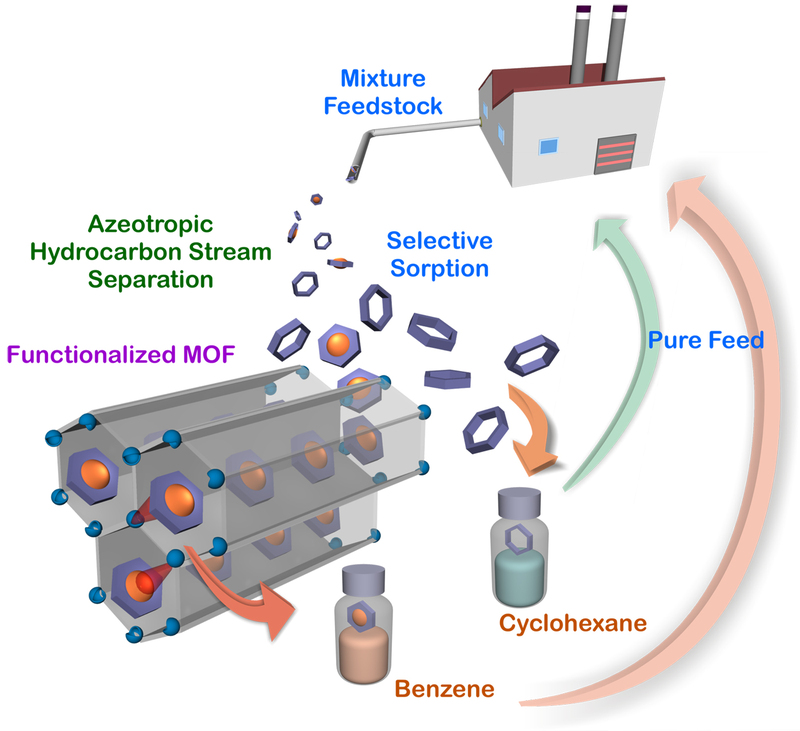 Schematic illustration of selective sorption based azeotropic C6 cyclic hydrocarbon stream separation by the open metal sites functionalized metal-organic framework. The global necessity of minimizing energy expenditure is well-known to the scientific community at large. Acutely energy-intensive azeotropic species’ separation protocols (extractive and azeotropic distillation) from the mixture hydrocarbon feedstock’s account for huge energy and cost penalty on a regular basis. Adsorption is considered a viable green alternative to mitigate the pressing issue of minimizing the sky-soaring energy expenditure. Recently, exciting chemical approaches have impelled the discovery of a number of promising features to the organic-inorganic hybrid class of new adsorbent materials such as, metal-organic frameworks (MOFs). Last decade has steadily observed the upsurge of this class of porous framework materials aimed at tackling energy and environment-related concerns such as, hydrogen storage, selective CO2 sequestration based Carbon Capture and Storage technology etc. Albeit substantial efforts led to the establishment of a number of suitably functionalized MOF sorbents for gas separation and storage applications; reports for analogous sorbent MOFs, suitably tailored for exhibiting solvent hydrocarbon vapor separation at ambient temperature and pressure-based sorption phenomena, has been particularly rare in the literature. In this work, unsaturated coordination sites, popularly expressed as, open metal sites (OMS) have been conceived to impart the desired functionalization to the ensuing OMS-rich water-stable MOFs, M-MOF-74 (an isostructural series of seven benchmark microporous MOFs; M: Mg, Mn, Fe, Co, Ni, Cu, Zn: with the highest OMS-density in the entire MOF regime). Based on deciphering the seemingly facile interactions between the π-cloud of target adsorptive Bz with the OMS-rich pores of M-MOF-74 framework via Lewis acid–base type π-complexation interactions, the aforementioned series was rationally chosen for comprehensive benzene/cyclohexane sorption selectivity analyses. As a befitting testimony to the pursued prefunctionalization approach revolving round the unsaturated transition metal centers, both the experimental and theoretical analyses synergistically confirm the precise role of OMS and the respective metal ions’ corresponding polarization power to derive the best-ever benzene selectivity for any MOF over cyclohexane (Fig. 1). As reiterated from theoretical simulations, the binary selectivity factor for Mn-MOF-74 reaches exceptionally high values of the order~105, which now propels it as the best benzene selective sorbent, among all MOFs hitherto reported. This report inaugurates the employment of OMS as a markedly efficient functionalizing factor aimed at deriving highly selective benzene sorption over cyclohexane. Such a new strategy, if further infused with other known functionalization principles, might indeed unravel new avenues to new-generation, industrially applicable superior sorbent bed materials for energy efficient separation. Harnessing Lewis acidic open metal sites of metal-organic frameworks: the foremost route to achieve highly selective benzene sorption over cyclohexane.